For years I’ve driven down I-25 in New Mexico and noticed the sign that says “The Very Large Array,” pointing off to the west. Each time I’ve reluctantly continued on down the highway because time wouldn’t allow the 55-mile detour to go see whatever it was. This time, we made time, and wow— we’re all really glad we did. You really have to see this thing to believe it. 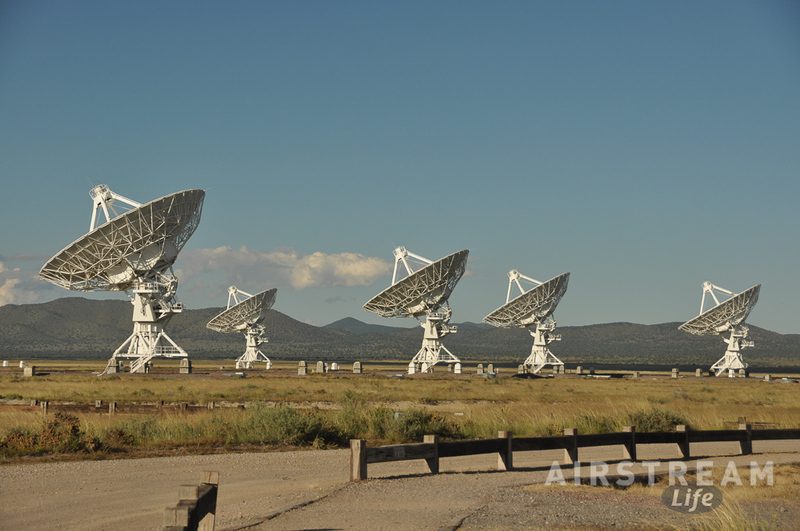 It is a giant radiotelescope, made up of 27 big parabolic dishes, each measuring 25 meters. All of them point to the same place at once, and the radio signals they collect from the heavens are combined (“correlated” in scientific language) using a big supercomputer into a single radio image. 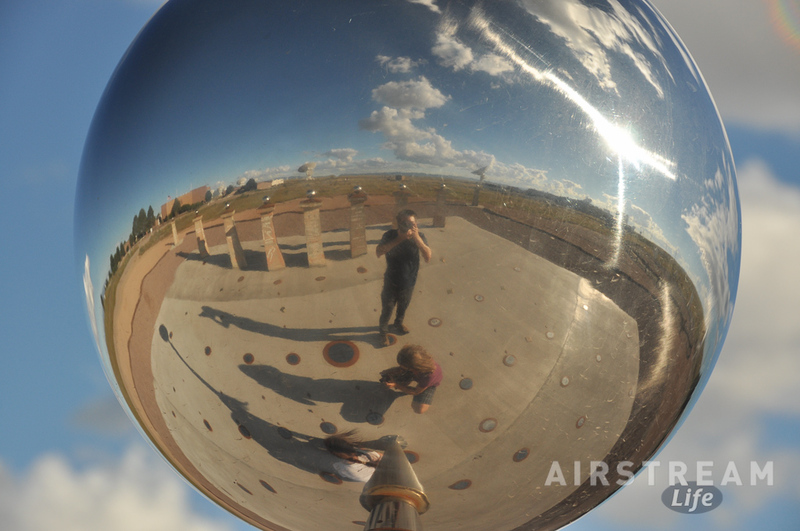 The effect is that the array acts like a single gigantic radiotelescope measuring 22 miles in diameter! 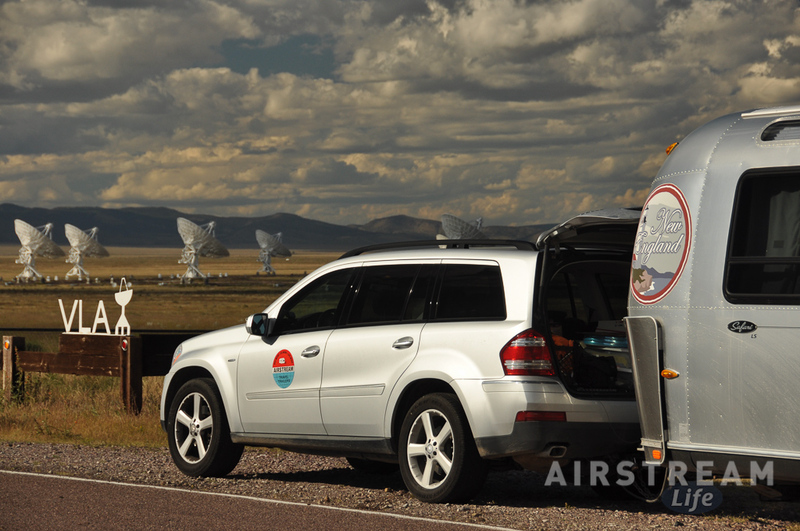 The array is placed far up in the New Mexico hinterlands, safely away from the radio signals of cities like Albuquerque, and high up on the plains (7,000 ft elevation) so that the signals have less atmosphere to pass through. Driving west on Rt 60 we could see the array from three miles away. It is so sensitive that visitors are require to turn off cell phones while in the area. I almost forgot to turn off the Airstream’s Internet until Eleanor reminded me. 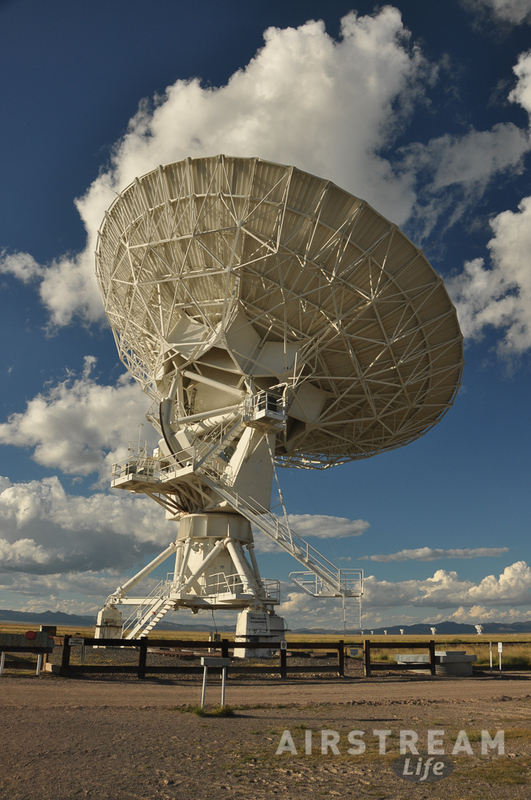 The VLA could detect a cell phone from Jupiter, half a billion miles away. Somebody thoughtful added a Visitor Center to this installation, which is easily accessed by RVs. Approaching the VLA, you get the sense that there should be barbed wire and armed guards anywhere, but in our entire visit (starting at about 4:30 p.m.) we didn’t see a single person other than a few other visitors. The staff works 24 hours a day but they are hidden inside buildings with the WIDAR supercomputer. You just walk right into the Visitor Center, press a button to watch the movie, tour the exhibits, and then take a self-guided walking tour around the facility. The tour brings you right to the base of one of these behemoth dishes, close enough to see it move (which it did without warning, twice, while we were there), and hear the “cryogenic refrigeration compressors” keeping the radio receiver at -427 degrees Fahrenheit (18 degrees Kelvin). That’s not a typo. Of course, not the entire installation is open to the public. You can’t walk around to the other antennas, and you wouldn’t want to anyway, since they can be spaced out as far as 21 miles. A rail system is used to transport the dishes as needed, changing their configuration in four different ways according to the needs of the scientists who are using the system. Yep, these 100-ton dishes are portable. 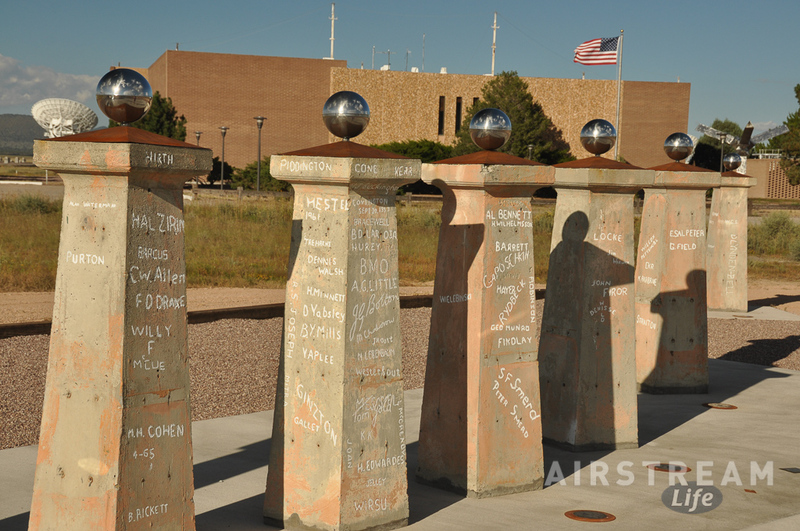 There’s also some interesting bits of geek history, like the pillars that famous scientists have inscribed their names on, and if you look closely you might even spot some interesting insect life. 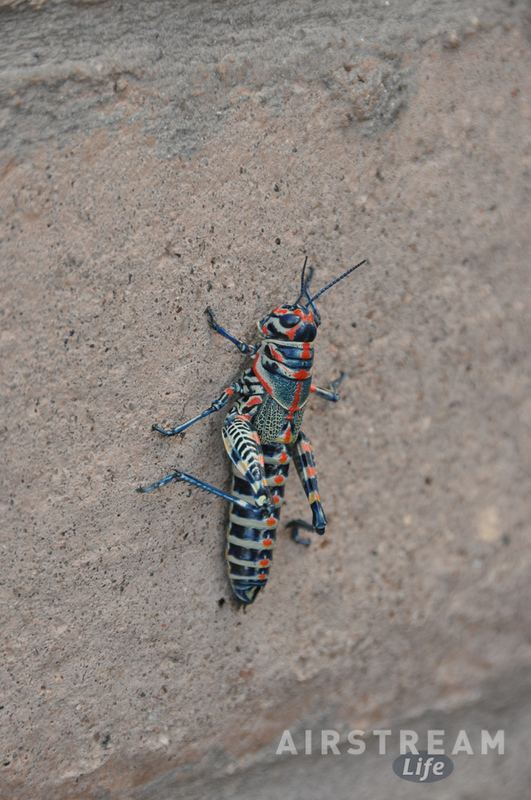 Grasshoppers were practically a plague in the roadway by the grassy fields, flinging themselves out of the way of the Airstream as we slowly towed down the entrance road. My only regret about the visit is that the tour does not include a peek at the supercomputer. I can understand why, but still I’d love to get into the room with a machine that can do 16 quadrillion processes per second. Overnight parking is not allowed, otherwise we might have just parked right there for the evening, since it was six p.m. when we were done. We hauled the Airstream another 15 miles or so up to Datil Well BLM campground, which turned out to be a very nice spot at 7,200 ft amongst juniper trees and rolling mountains. For $5 a night this spot is really a bargain. The sites have no hookups and they aren’t level, but you get repaid for that in beautiful scenery and quiet. There’s even a tiny cabin that serves as a visitor center with information about the cattle drives that used to come through this area, and unbelievably, free wifi inside the cabin. I don’t know how they’re providing that. My phone reports one bar of Verizon or “No Service” and is unusable for calls. 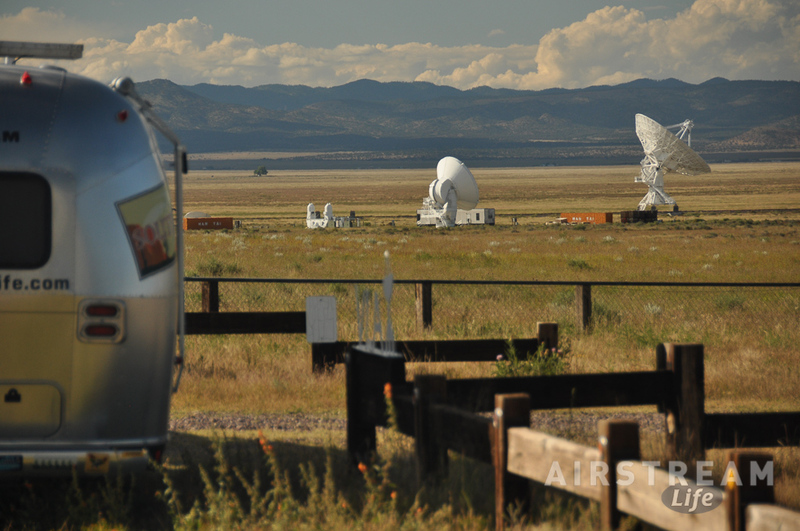 However, our Airstream Internet is working very well thanks to the booster and rooftop antenna, so once again I’m very pleased with the tech upgrade I did last spring. We had a freezer incident yesterday. Somehow the door did not fully close the night before, and some of our food defrosted, including two of the steaks we bought in Capulin. So last night Eleanor cooked them in a cast-iron pan, and also roasted green beans, onions, mushrooms with red wine & garlic, and white beans with rosemary & garlic. It was a late night dinner followed by the last slices of almond cake with apricot cream that she made to celebrate the Harvest Moon a few nights ago. I imagine people in campsites nearby were wondering what the delicious smells were at 8 p.m., far up here in the New Mexico boonies. Thanks for a great heads up. Something we would never know to look for.